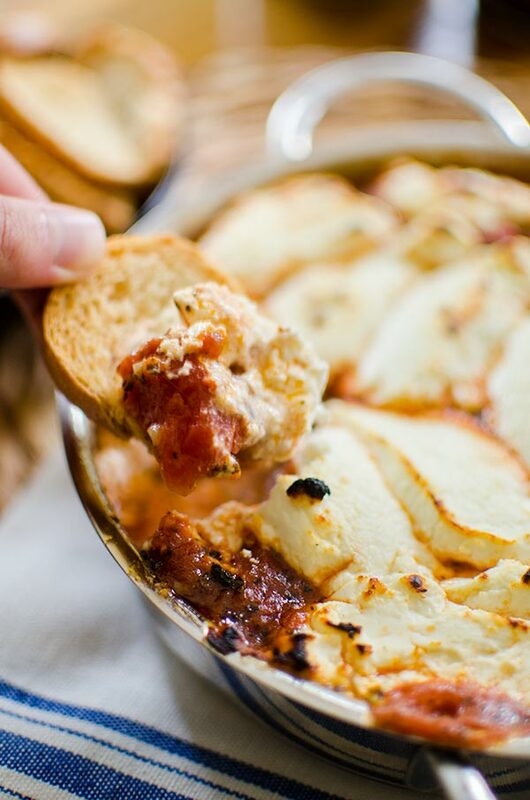 Fire roasted tomato goat cheese dip is a simple and sophisticated appetizer made with a can of fire roasted tomatoes, garlic, herbs and goat cheese. There’s something to be said for simple, crowd-pleasing appetizers that are a little more on the sophisticated side of things. This fire roasted tomato goat cheese dip is exactly one of those kinds of dishes. Recipes like this are all about the quality of ingredients and this dip is made with only the best: flavour-loaded organic fire roasted tomatoes, garlic, oregano and basil and to finish it off, tons of tangy goat cheese. The depth of flavour that is developed with these simple ingredients is mind blowing – this is my style of cooking to a T.
Over the weekend I had a couple of girlfriends over for some apps and wine. The occasion? There was a basketball game that called for some delicious eats. For the first time ever, the Toronto Raptors have made it to the Eastern Conference finals which is huge for us. To mark the first home game of the series, I quickly whipped up a batch of this warm fire roasted tomato dip and toasted some slices of baguette for crostini. Just like that, within about 30 minutes, we were ready to go. This is the kind of appetizer that is perfect for entertaining no matter what the season because it’s made with ingredients that you know will be of the upmost quality year-round. 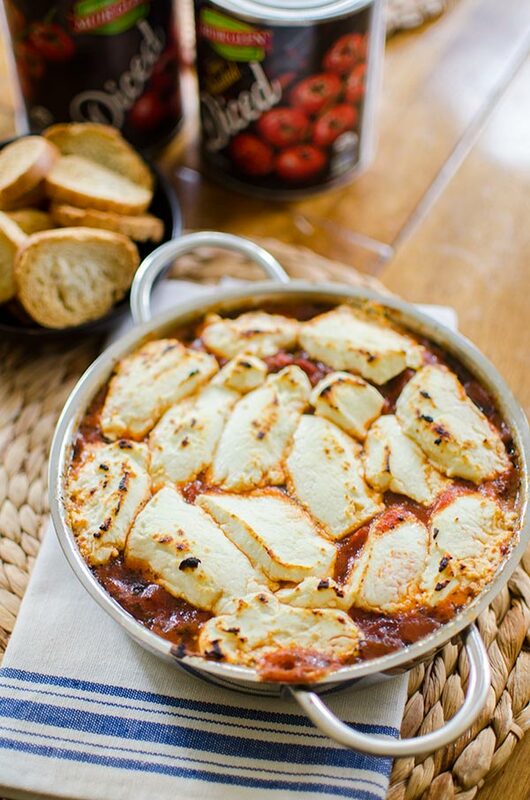 In the winter, the combination of warm tomato and bubbling goat cheese will warm you up on even the coldest nights, and in the summer, you can enjoy this dip on the patio with a cold glass of cab sauv. Using dried herbs in this recipe as opposed to fresh also means this dish can be made year-round. Finally, the star of the show is the somewhat sweet and smoky tomato mixture, which starts with a can of fire-roasted tomatoes. Using canned tomatoes for this dip means that you can ensure there will be tons of flavour no matter what the season. I’ve always been partial to fire-roasted tomatoes, but have found that they can be a little difficult to find in Toronto, luckily Muir Glen is now available in Canada which means you can use their tomatoes in all of your favourite dishes like slow cooker monster meatballs in tomato sauce or you could even add them to my 20-minute marinara sauce. Luckily for you, you can get your hands on a Muir Glen prize pack and a $50 President’s Choice gift card. Just enter the giveaway below and leave me a comment and share your favourite appetizer! This recipe is originally from A Couple of Cooks. In a medium pan, heat olive oil over medium-high heat. Add garlic, basil, oregano, salt and red pepper flakes. Saute for 45 seconds or until garlic is fragrant but not browned. Stir in the tomatoes and heat at a gentle simmer for 10 to 15 minutes, until the sauce starts to thicken. Remove from the heat. 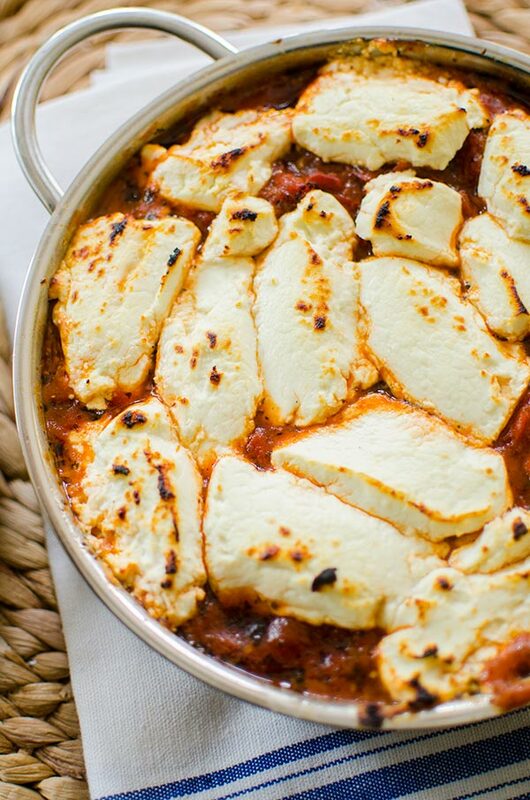 Pour the tomato mixture into an oven-proof baking dish, top with sliced goat cheese. Bake for 15 minutes, broil on high for 4-6 minutes, watching carefully, until the goat cheese is golden brown. To make crostini, slice baguette and toast at 375F for 15 minutes. 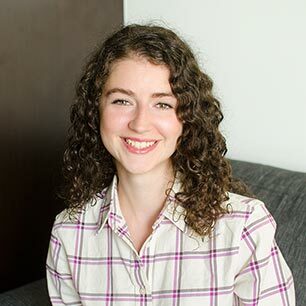 Disclosure: This post was sponsored by Muir Glen – as always, all opinions are my own. Thank you for supporting my sponsors and allowing me to continue creating content like this fire roasted tomato goat cheese dip! Looks delicious! Going to have to make it this weekend! This looks like my kind of snack!! My go to appetizer is hummus with vegetables and pita bread. I like putting out a couple different cheeses served with crackers, olives, and maybe some fruit and nuts. My go to appetizer is crackers with a variety of cheeses. This is my new go to appetizer! Thx for sharing this Lou!! My fav app is usually some sort of flat bread and dip, but will definitely try this next wknd. Wow, this just looks awesome and is my kind of appetizer! I tend towards hummus and pita chips/baked olives and grapes or something like that or in the summer fresh green peas and fresh salsa crostini. These tomatoes sound so good and I look forward to trying them! Always good to have some good quality canned tomatoes in the pantry! This looks very chix and delicious!! My go to appetizer is definitely brie w/some delish red pepper jelly. Favorite appie? That would have to be bacon wrapped chicken bites! What a great idea! It's simple but sophisticated, can't wait to try it. My go-to appetizer is definitely nacho chips and a whole assortment of yummy salsas and dips! I have a black bean salsa recipe that I love serving. Black beans, tomato, cilantro, garlic, avocado, cumin...mmmm. Mmm cheese. I love a cheesy artichoke dip with warm pita. Love this recipe Lou!! My go to favourite app is burrata or ricotta cheese on toasted baguette with honey drizzle! My go to appetizer has got to be fried pickle spears! At home by myself or family, chips and salsa are a go to appetizer, but if I have company over I go with mozerella sticks. We like hummus and veggies. I make mini springrolls & samosa. I always go for mini quiches. They look really cute and are surprisingly easy to make. I usually stick with a nice big charcuterie board. Can wait to add this to the rotation!